LLJ Group provides small business owners with the cash flow management, profit management, and bookkeeping services you need to increase earnings and take your business to higher and higher levels of success. We have over 20 years of experience and currently serve the continental US. Due to the popularity of our services, we are only able to add a limited number of new clients each year. If you would like to be considered, contact us now before all spaces are filled. LLJ Group utilizes the Profit First method of profit management. Our team is trained and certified by the Profit First Professionals organization to guide business owners and entrepreneurs in maximizing their profits. While QuickBooks® is user friendly most people still need QuickBooks training to effectively set up the software, efficiently utilize appropriate features and ensure their data is being input in a correct manner. Nothing is more frustrating to business owners than not trusting the numbers in their accounting software; accurate numbers they need on a daily basis to make wise business decisions. Our QuickBooks training classes are designed to meet the needs of each and every attendee and here is how we accomplish that goal. We conduct small classes, typically with 5 attendees or less and call one to two days in advance of the class to identify your biggest problems in business and with the software so we can provide specific training relevant to your situation. We use the information from our call to determine the direction of the class, and may focus in certain areas listed below, more than others. What is important to note is that we cover all of the material, but will spend the most time on information that will best help you succeed. 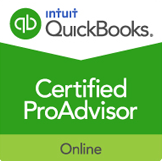 Now is your chance to learn QuickBooks® in as little as 4 hours. Save time and money by taking this QuickBooks basic training course, special pricing $147. Your satisfaction guaranteed!